Good Riddance to Bob Menendez? The New Jersey Democratic senator, indicted on corruption charges, has a long history of siding with AIPAC and the GOP over his own party. Menendez held a defiant press conference on Wednesday evening (before officially pleading not guilty today), declaring his innocence and, as he did when news of the imminent charges broke last month, telling reporters, “I am not going anywhere.” That may be true, in terms of Menendez’s Senate seat, but the Democratic hawk already gave up his powerful post as ranking member of the Senate Foreign Relations Committee (a position he hopes to retake when cleared of the charges). Some of the media coverage of the charges suggested that Menendez’s departure from his leadership position would harm Democrats—but that’s not quite as clear as it seems. Indeed, in lamenting the Democrats’ loss, National Journal noted Menendez was able “to work with Republicans and has earned their respect through his occasional battles with the White House over foreign policy.” That hardly sounds like a leader of the caucus, but rather like a senator who has worked hand in hand with the most obstructionist critics of the Obama administration’s foreign policy. The constant efforts, in cahoots with Republicans, to constrain the Obama administration’s diplomacy with Iran, for instance, have divided Democrats bitterly. In January of 2014, Menendez, along with rapacious anti-Iran Senator Mark Kirk (Ill.), introduced a new sanctions bill backed by the powerful anti-diplomacy American Israel Public Affairs Committee (AIPAC). Critics said the bill would kill the interim agreement struck by Iran and world powers—the framework that just today bore fruit as negotiations toward a comprehensive pact advanced—leading to widespread opposition among the Democratic Senate leadership. When liberal grassroots groups rallied enough Democrats to sustain a promised presidential veto, the bill failed to come to a vote. This year, Menendez introduced another sanctions measure with Kirk, but it too has so far stalled without the necessary Democratic support. He also sponsored a bill with Republican Foreign Relations Chair Bob Corker to empower Congress to vote on any deal with Iran—earning another veto threat from Obama. And working with Republicans came back to bite Menendez when Majority Leader Mitch McConnell couldn’t restrain his partisan impulses and sought to bring the bill to a quick vote; even Menendez himself had to object. These are just a few examples of Menendez siding with AIPAC and its Republican stalwarts over the White House and a majority of Senate Democrats. At times, Menendez’s rhetoric has been harsh. He reportedly clashed directly with Obama at a Democratic congressional luncheon in January. Later that month, he berated administration officials defending diplomacy: “The more I hear from the administration and its quotes, the more it sounds like talking points that come straight out of Tehran,” he said. In a 2013 hearing, Menendez went after Undersecretary of State Wendy Sherman over the administration’s policy on the exiled Iranian exile group the Mojahedin-e Khalq (MEK), a hawkish, cult-like outfit that pushes for regime change. But Menendez’s strategy has paid off—literally. Menendez received more campaign contributions from the MEK and its allies than any other member of Congress, according to a study by Eli Clifton and me for our piece on their relationship in the Intercept. And during his 2012 re-election campaign, Menendez garnered more contributions from pro-Israel groups than any other senator, according to Open Secrets. 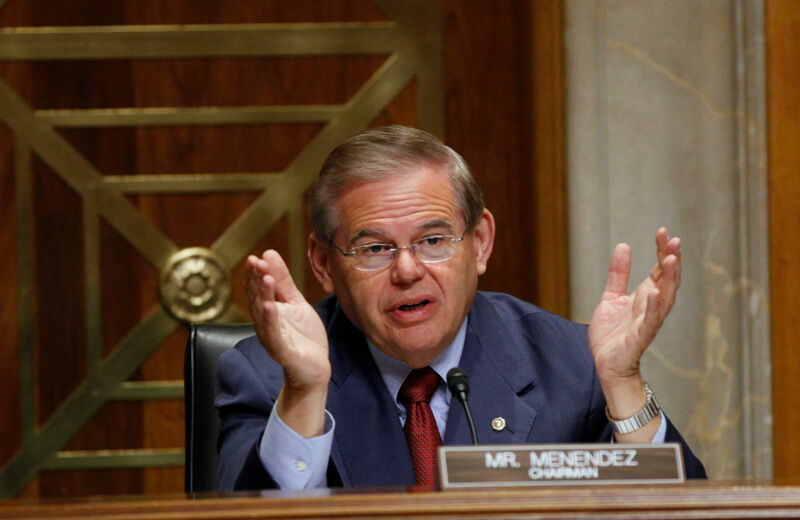 This winter, the Israel lobby flagship gave Menendez a hero’s welcome. Today, AIPAC leaders and other pro-Israel donors are funding and bundling contributions for his legal defense. So Menendez has a long record of taking money from donors and advocating the policies they support. No one—certainly not me—is suggesting that his work on behalf of groups like AIPAC and the MEK rises to the level of corruption. And, despite the neocon conspiracy theories, the charges aren’t retribution from Obama. But allegations that Menendez took money to do favors shouldn’t come as a huge surprise to anyone. He is, after all, from New Jersey.